The Cocoa Diaries: How do you like your genius? British and European fans are currently getting the chance to spend a ‘Wonder summer’s night’ with one Steveland Morris nee Judkins, at various venues such as the O2 in London. The Cocoa Diaries own Ms Quiche expressed her concern recently by saying ‘yeah mixed reviews, right?’ – which came as a genuine surprise to me having seen the first London show a few days back. I left feeling it had been a show befitting a great artist – so why the disparity? We live in an age – as previously discussed – of 24 hour entertainment, where attention spans are short (do all critics stay for the second half of a live show?) and reviews are immediately posted online, not to prevent you having an opinion yourself but to help shape it and influence your decision whether or not to buy a ticket. The superstars of the 70s, 80s and 90s compete now, not only in a crowded live music scene (with concerts more popular than ever currently) but also in a fragmented mass media, one however which is still dominated by the sensibility of the rock critic looking for edgy alternatives to the mainstream. Retrospectively I looked at a summary of reviews from various UK papers of the Stevie Wonder show I saw, and they talked not about the diversity of music played -which seemed a given, and ultimately forgotten - but of the ‘lack of pacing’ involved. How strange. Stevie Wonder appeals to an incredibly diverse audience lest we forget, but it seemed that in the main the only ones prepared to pay to see him at the O2 were white working professionals over 30 years of age. Ticket prices may have had something to do with this of course, but why the frustration with the performance? In a bar after the show one guy told me how much time he felt Stevie had wasted playing ‘Ribbon in the Sky’ for ten minutes when he could have squeezed in more from his back catalogue. Without burdening ourselves too much with race it would seem that there is a clear difference between what a certain audience member might expect for their money and the cultural aesthetic of the artist. When you’re in Stevie’s house it’s a night on his terms, and not necessarily a top ten hit sing-along from start to finish as the nature of genius is a tendency towards the unpredictable. Is it too much to ask of the audience to consider that maybe those onstage aren’t quite like them, or perhaps have slightly differing expectations? You could almost sense the boredom and the impatience setting in while the majority waited for the ‘hits’, while I just felt grateful to have heard him play bursts of Miles Davis on the harmonica. It reminded me of a similar experience several years previous, the only time I saw Whitney Houston perform live (at Wembley Arena), where she excitedly announced that the middle section of the show would be a nod to her Gospel roots. The crowd were under whelmed to say the least even though her singing was passionate and far more remarkable than on ‘I Wanna Dance With Somebody’. The audience ultimately hears what it wants to hear in many ways and greater writers than myself have written at length about the nature of black artists in America ‘crossing over’ to the mainstream, but also the difficulty they may have in crossing back. I’ve also been interested to note another trend, which is how often messers Simon Fuller, Cowell et al and their X-Factorisation of music is peddling and helping to maintain a certain set of guidelines in mainstream music (completely separate to, but equally as damaging as the dominance of the rock critic mentality in its own way). It’s particularly odd when series after series certain young hopefuls are told in the latter stages of the ‘competition’ that they have a Gospel sound, this is almost without exception the sound of the death knell for their chances. This is of course laughable considering that Gospel is one of the major touchstones and building blocks of popular music, while Simon Cowell’s CV name-checks such achievements and cultural heavyweights as Jive Bunny and Sinitta. Getting back to Stevie Wonder however, the reaction of audiences and critics to his show is almost confusing when considering the sheer number of hits that were played on the night – mainly from the 60s/70s and 80s – but still the complaints about the opportunity to play more from his back catalogue. Clearly the first sight of this genius for 10 years (or ever for some) wasn’t enough – which leads me to believe that it was the packaging or the presentation of the material on show that was also clearly an issue. I read the strapline ‘A Wonder Summer’s night’ as a one off chance to be in Stevie’s house and hear what he had to play, so why then did audience members feel short-changed when his 2.5 hour show wasn’t one continuous hit-laden medley? Maybe there’s been one too many greatest hits albums being packaged and put out there, which means that people don’t listen to the original albums in their car anymore, preferring MP3 compilations. In one sense the established artist in this case is damned if they do, and if they don’t. If they play nothing but hits they’re seen as trading on the past and having lost their edge, and having nothing left to offer. If they experiment or play music they themselves enjoy, audiences often reject them acting like spoilt children at a birthday party. As Louis Armstrong said (and it’s fair to say that he would have been an authority on the subject), there are only two types of music – good and bad. 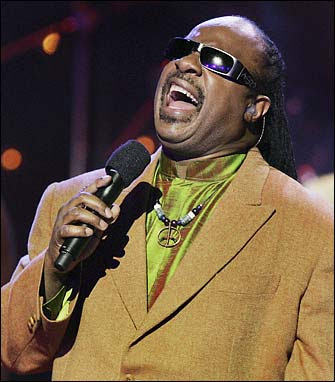 In the case of Stevie Wonder, over 90% of that music is exceptional in my opinion, but don’t take my word for it, trust your own instincts and find out for yourself by catching his live show which returns to London later this month.